Nothing improves the look of a vehicle more than a set of aftermarket wheels. 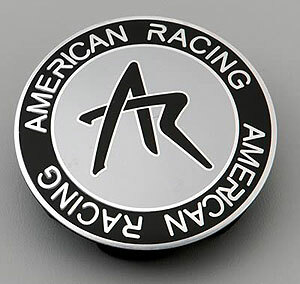 American Racing Center Caps and Accessories are an important part of adding to the appearance and personalization of your custom wheel package. They are manufactured using high quality materials with finishes to compliment the wheels they are designed to fit. Whether you need a single replacement or a complete set, JEGS is the place to find what you are looking for! 1242100S is rated 5.0 out of 5 by 2. Rated 5 out of 5 by CeeDee from As advertised Good price, correct part, quick delivery. What else is there. Thx Jegs !! Rated 5 out of 5 by johnt from AR center cap One of my old caps started showing wear so I replaced it with your new one. Fit perfectly, was priced fairly and delivered immediately. All good! This may work provided the center hole in your wheel measures 2.420 inches.